What is a Louisiana Eviction Notice? Louisiana Eviction Notice: What Is It? A Louisiana eviction notice is a written document authored by the landlord or the property management company to inform the tenant of the rental property that they’ve violated the lease agreement in some way. It gives the tenant a certain number of days to fix the violation or vacate the property. Also known as a notice to quit, an eviction notice is the first step in the eviction process. All Louisiana eviction notices must comply with landlord-tenant law. What Are the Components of a Louisiana Eviction Notice? The legal name(s) to whom the eviction notice is being issued. This should match the signature(s) on the lease agreement. The address of the rental property, including the city and county. The reason why the eviction notice was issued. The date by which the violation should be corrected. The contact information for the landlord or their agent. 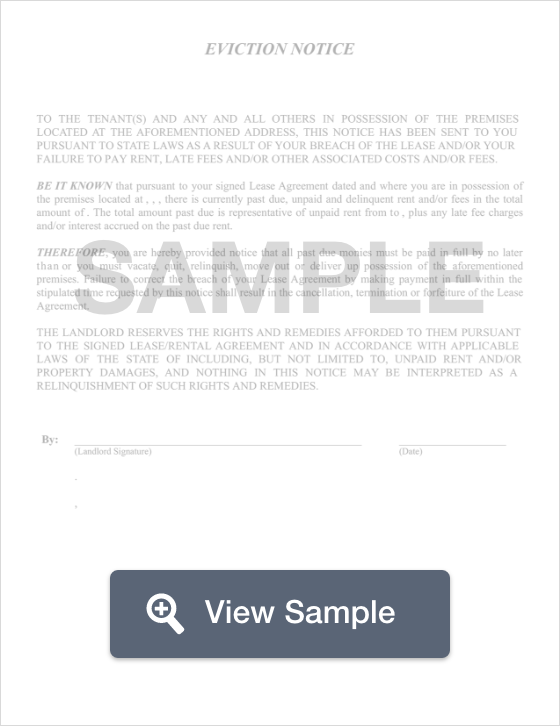 The signature of the landlord or their agent. A completed certificate of service. This should include the date that the eviction notice was served, on whom it was served, how it was served, and the signature of the person who served the document. Mailing the eviction notice via certified mail with a return receipt requested (the return receipt must be filed with the court). Notice begins the day after the eviction notice is served and does not include holidays or weekends. A 5-day notice to quit for non-payment of rent is an eviction notice used in Louisiana when the tenant doesn’t pay their rent on time. It is governed by CCP 4701. It gives the tenant five days to pay their rent or vacate the property. This notice should include the amount that is past due, the deadline by which it must be paid, how it must be paid, and where it must be paid. A 5-day notice to quit for non-compliance is an eviction notice used in Louisiana when the tenant violates their lease in some way aside from non-payment of rent. It explains the lease violation in detail and gives them five days to correct the violation. This notice is governed by CCP 4701. A 10-day notice to quit for a month-to-month tenancy isn’t quite the same as an eviction notice in Louisiana. The tenant doesn’t have to violate the lease to receive one. In fact, either the landlord or the tenant can use this letter to end their month-to-month tenancy. It gives notice that the monthly lease will not be renewed. This letter is governed by CCP 2728(2). What Are the Legal Considerations of a Louisiana Eviction Notice? Eviction notices are the first step for landlords to take in the eviction process. In fact, if the landlord serves the tenant via certified mail with return receipt requested, the return receipt must be filed with the court. Eviction notices must contain the components as discussed above. They must comply with Louisiana’s landlord-tenant laws. Louisiana landlords may not use “self-help” methods for eviction. They must follow the state’s legal eviction process. Self-help methods include changing the locks, shutting off utilities, and removing the tenant’s belongings from the property. The only way landlords may do those things is if they first get a court order. Landlords also may not evict tenants to retaliate against them for reporting the property or the landlord for housing code violations. Landlords may not evict tenants based on their family status, gender, race, skin color, religion, country of origin, disability, or age. If a landlord engages in illegal eviction, a tenant may have a legal claim against them. If you’re renting property in Louisiana and you receive an eviction notice, make sure that you read it carefully. You need to understand the reason the notice was issued and the deadline by which you must correct the problem. Contact the landlord if you have questions about the eviction notice. Receiving an eviction notice can be upsetting. Make sure that you remain calm. Eviction notices must contain certain information and they must be legally served as discussed above. You cannot be evicted for reporting code violations or for reasons that may be discriminatory. Landlords may not change the locks, remove your belongings, or shut off the utilities to the property unless they have a court order. If you believe that you may be a victim of an illegal eviction practice, you should call a landlord-tenant lawyer. You may be eligible to file a lawsuit against the landlord. If you cannot afford a lawyer, you should contact Louisiana State University Law Center, Loyola University New Orleans School of Law, Southern University Law Center, or Tulane Law School and ask if they have a legal clinic. Legal clinics are helpful because they provide low-cost legal help to the public. You can also contact a legal aid office in your area. If you meet their income requirements, you may be eligible to receive free or low-cost help with the eviction. They also have free resources that are available to the public regardless of income. Louisiana landlords must follow the landlord-tenant laws in the state. An eviction notice must be served on the tenant. If you serve the tenant via certified mail, use a return receipt. The return receipt must be placed on file with the court. Review the required components of a Louisiana eviction notice as discussed above. Also, make sure that you’re not engaging in self-help eviction, retaliatory eviction, or discriminatory eviction as discussed under Legal Considerations. That can give the tenant the legal right to file a lawsuit against you. If you have questions about eviction notices or your rights or obligations as a landlord, make an appointment to talk with a landlord-tenant lawyer.